Here you will find news and articles written by the uk-ufo team that we feel is important and could be of use to others. For years Area-51 has been a subject that has brought suspision to everyones mind about the truth behind UFOs as this is where most of the research is supposed to be carried out by the military, noone knows the truth about Area-51 up to now and the government aren't being much help into putting our minds at rest as they wont release the truth about what its used for, we just get told the same old story.....its an airbase and has nothing to do with UFOs, if this is the case then where did the suspision arise from, there has to be some truth in the "rumours" that are world famous, and for an airbase its very well protected, more so than other airbases so obviously there is more to Area-51 than meets the eye. Personally i don't feel that we will ever know the truth as the government aren' much help, but we all have our own views on what Area-51 is actually used for and why everything there is so secretive. Below are some images of Area-51, if you have any ideas as to what Area-51 actually is, or you have your own theory/opinion then uk-ufo would like to hear from you, just go to the "contact us" page and E-Mail either myself (Nathan) or Paul and we will put your theory/opinion on this page. Stonehenge is made up of 83 stones and can be found in Wiltshire, UK. There are many theories about what the purpose of this huge prehistoric monument was actually built for, there are a wide range of theories about the purpose, some say that it was built as a memorial for the dead, some say that it was built for the Druids to welcome the sun during the summer solstice, but personally I feel that the most interesting theory is that it was used as a kind of “runway”/landing space for U.F.Os, but if this is true then why don’t they still use it as a landing space, is it because they have got what they came to earth for, or is it because they have studied our planet for years and decided that they don’t want to be here anymore? 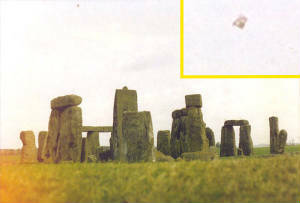 There have been many sightings of U.F.Os around Stonehenge and many ufologists congregate at Stonehenge for sky watches throughout the year, throughout the UK Stonehenge is classed by many as a U.F.O “hotspot”, this is because of the number of sightings there has been around this area and around Wiltshire. The earliest recorded sighting I could find was recorded around the 1960s, however this may be incorrect (if you know otherwise then please contact me), or this may have been a simple hoax. 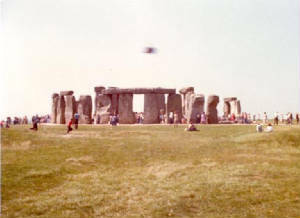 If you have seen a U.F.O at or near Stonehenge then please contact me via E-Mail and I will get back to as soon as I can. 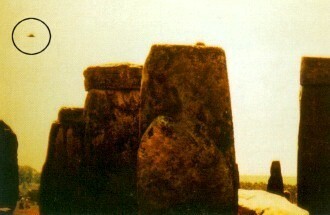 There are some pictures of U.F.Os and Stonehenge which you will find below, I would like to hear your opinions about Stonehenge and would like to hear your views on Stonehenge, if you can send them in via my E-Mail at the bottom of the page, I will read and reply to everyone and put some on the site.